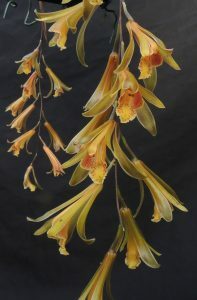 As winter draws in we are surrounded by Cymbidium species in spike or in flower and one of the most unusual is this very pendulous species from the Himalayas. 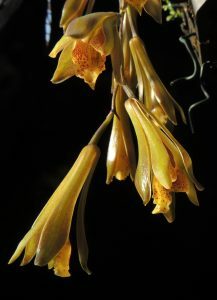 Cymbidium cochleare is a species we have seen in Sikkim and in the wild or cultivation it is instantly recognisable from its very thin pendulous flower spikes with glossy pendulous flowers that smell of jasmine. We have a record three spikes on our specimen plant this year. 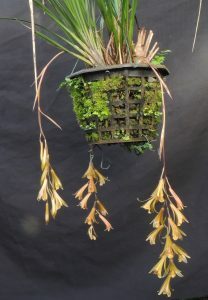 The plant is a delicate cymbidium with fine dark green leaves and this species really needs to be in a basket to allow for the flower habit.